I am planning to buy a 1/4" snake, cut it in half and mount 1/8" jacks to the cut ends; that gives you half the length of the snake, but twice the number of cables. You're going from 1/4" to what? EDIT: Ah, you mean the "floating ring" type? Your breakout box could be a module. You could bring your lines in to the back of a module so the jacks are integrated, or connect to the front of a module using something like DB connector, if that's more practical. If you're on a tight budget you could buy a roll of 18 gauge zip (lamp) cord and make individual cables from that and tie them into a 'snake' with wire ties. 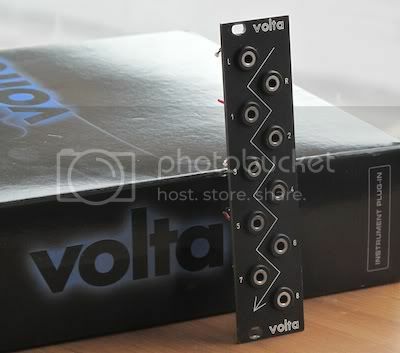 There' no audio going TO the modular from Volta that I'm aware of, just CV's, gates, DC voltages, etc. The only audio is coming back into Volta and that's only for calibrating oscillators so zip cord might even work for that too (not sure). Are you going to 1/8"? Zip cord may or might not work with small plugs. I bit the bullet and bought a 24I/O on ebay, ran a long audiowire (Firewire) cable to it and set it on top of my dotcom system backwards with the jacks facing me. Instant patch bay. Also have plenty of outs to run audio (like loops) from the computer right into the modular at the same time. I'm really happy with this setup, but it wasn't cheap. 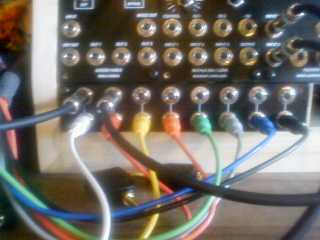 i took a multiple panel from bridechamber and wired it like a patchbay but left out the ring. i run a snake from my motu into the patchbay. really happy with this method. Yeah, I meant the floating ring types, 1/4" to 1/8". I'm not at all the DIY type, so I was thinking of either buying pre-made cables (at $12 a pop, unless someone knows of a cheaper place), or finding someone to build me a simple module to act as a patchbay (either eurorack or 1U). I think the later would end up being cheaper in the long run, when dealing with more than 8 I/Os, but running cables direct from the soundcard into the modules seems simpler... so I don't know! I just email Alex at Ad Infinitum, and his UM410+ is perfect as an interface box, as it does not short the ring to the sleeve, so I think I'm going to go with that! Either disconnect (or don't solder) the ring on a stereo jack, stick the stereo with the ring attached into the MOTU and the 1/4 where you've cut it off into the desired CV socket. 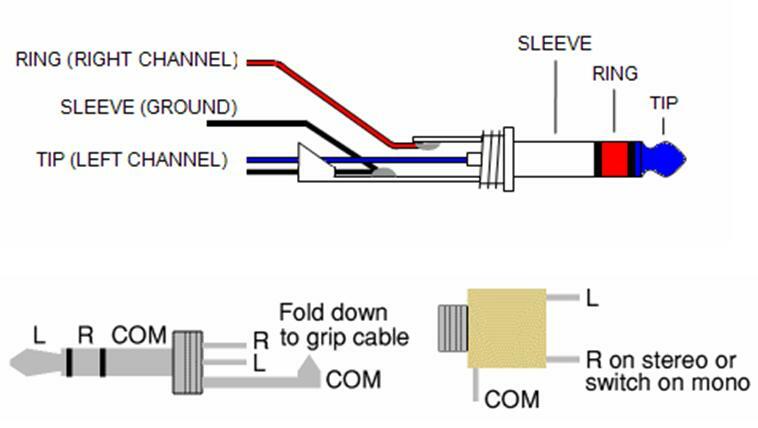 Or use a jackfield (patchbay), and don't connect the ring in a female socket. Ill see if i cant find a photo of it later, but somone asked me to cut a 4hp euro panel for his setup some time back. I think they were just planning on using the standard cliff jacks, to match their other euro modules. Im sure i did see a photo on this forum of the item in use, but, where - who knows! I built a 32 port patch panel for stretta for the 1512 modular which is currently under construction. You can see the progress in the eurorack forum. Since we were dealing with 2 - 828mk3s, we elected to cut the cables and solder them to the jacks on the panel (or at least the is the plan). That way the 828 can face the correct direction and the patch panel takes care of the jack conversion. Further more, we can locate the patch panel in the rack where it makes the most sense. Nice and clean and it wasn't too difficult to build. However, with that said, the panel shown above is really nice. Yep, that was the one - thank you. I seem to remember that i cut two at the time, so there must be another user out there with the same panel also, but i cant be sure of that at the moment. Do you find the panel usefull in your setup? that is the plan... integration into the rack... but alas I think I'm going to sell Volta a well. I've installed it months ago and just haven't used it. yeah it was a great panel but I'm moving to a new case where everything goes in the front, won't be able to have any bus lines coming out of the back of the case... which is a shame in some ways cos I prefer to keep things tidy. yeah sure, I'm making it myself But having cables coming out of the rear or sides isn't suitable in this situation. As for Volta, it offered me nothing Silent Way didn't.. and SW offers me a lot more besides. yeah that wouldn't be so bad but to be honest things like the ES3 mean that is redundant also.